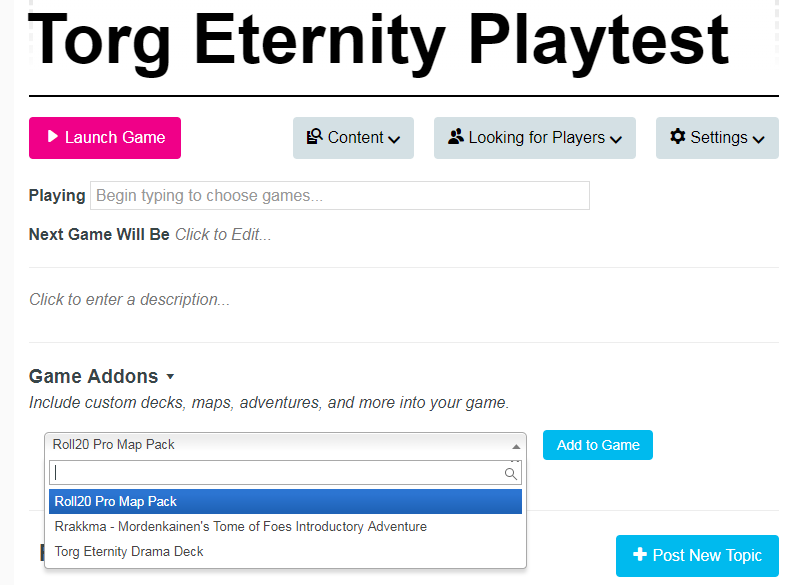 The Torg Eternity Drama Deck is now available for sale in the Roll20 Marketplace! The price is $9.99 and includes all of the cards in the physical Drama Deck box, including 60 Destiny cards, 40 Drama cards, and 10 Cosm cards from each of the eight cosms in Torg Eternity. 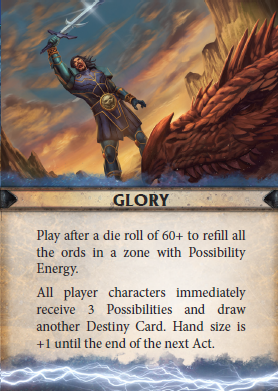 Additionally, two custom decks are included: a 58 card Destiny deck that takes two Glory cards out, in case you find that too many Glory results occur in your game, and a 114 card “double” Destiny deck that includes two of every card except for Master Plan and Glory. All of these decks are customizeable. First off I want to send a huge thanks to Matt Ritchie for paving the way of how to do this. It was a learning experience on my part, and it would have been a lot harder if Matt hadn’t already done it and posted a video on YouTube about it. Check his channel out, there’s some useful stuff there. Just click on the down arrow next to Game Addons and it should show up. Once you add it to the game, it’s ready to use! in the upper right corner. Each of the decks are listed, including the extra Destiny Decks. By default players can draw cards from all the decks, but you can change that if you want by clicking on the deck’s name in the sidebar. When it’s time to start going to rounds, hover your cursor over the Drama Deck back (in red) and click. This will draw the next card and put it on top of the deck and discard the current card (if any). You can see the cards that have been discarded by selecting Discard in the pop up menu when you hover over the face up Drama card. To see the face up card in detail, click on it, and it will pop up for you. When it’s time to shuffle, just select that option in the pop up menu. The Cosm decks are fairly straightforward to use. You can either choose Deal from the pop up menu, or allow the characters to draw a card themselves. This will put a Cosm card into their hand. The player can take a look at the card by clicking on it. She can then play it by dragging it onto the play surface. To discard, right click the card and select Delete. By default the GM can see what cards are in the players’ hands. Just move cards that are in your hand to the right of the Pool card, and those in your Pool to the left. You’ll need to view your cards by All Cards in Hand in order for this to work properly. 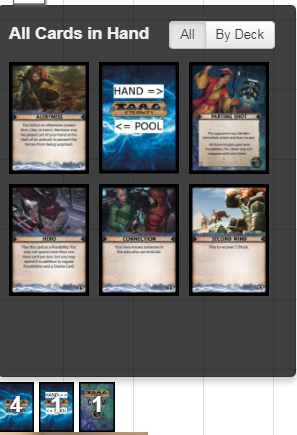 If the GM wants to grab all cards from a certain deck, all she needs to do is select the Recall option from the pop up menu and all cards of that deck in the player’s hands (and pools) will be put into the discard pile. And that’s pretty much it! If you have any questions just head on over to our forums! physical Drama Deck, it’s possible ?